"I will free you, i will free all"
Independent manifestation(B): The ability to appear without a summoning ritual and continue existing without mana supply from a Master. It also confers resistance against the imposition of death and attacks affected by time manipulation, as one is a confirmed existence. V is a manifestation of Chaos and will exist until the end of time. Autority of the beast(A): this is an Anti-Humanity Skill used as the Class Skill of the Beast-class. V's rules over darkness and all of the things who live inside it. Nega-reality(EX): a skill that represents V's nature as the antithesi of truth. In her pressence, things like "the skill to see though falsehood" or "the power to reveal the true form of things" are render useless because in the end, truth does not exist. Eater of souls(A): while any servant can absorb the lifeforce of humans, Beast V is a special case, as she can devour the origem of anything. living beings, objects and even other servants and noble phantasms. Furthermore, all that she absorbs is added to her Chaos allowing her to use its skills and characteristics. At this rank Beast V can raise her strength for the whole duration of the battle. Furthermore, because of her "Nega-reality" skill, the can ignore the effect of being reverted to her original form. This is Beast V sublimated in a noble phantasm. Her own existence denies the order of the world. Passively, it allows her to negate the reason of anything she enters in contact with, even the ground which she stands becomes incomprensible. Her touch strips everything until only the origim remains, she then can choose to devour it to gain it's characteristics, or remake and release it back into the world as an extension of her. But the most scary thing about this noble phantasm is her true activation. By calling it's name, Beast V can extend her influence to the place around her, transforming the world into a place of Chaos and ilogicalities. In this new world even the most solid shapes and certain conceps melt back into nothing. As it devours all, it's range continuos to grow and, if not stoped, may engulf the whole planet. Beast V is Apophis, aalso called Apep, the incarnation of Chaos and Ultimate evil in egyptian mythology. Unlike Seth, who represents violence for the sake of order and control, she represents violence just for the sake of violence. In her legend, Beast V would battle Ra and his atendants every night during their passings through the duat, in a attempt to eat the sun and plunge the world into darkness, getting really close to win some times. As an evil of humankind, Beast V symbolises the sin of freedom, that is "desiring to live in a world without laws". Beast V is moved by a desire to grant freedom to humanity. Unfortunaly, she belives that the only way to achieve true freedom is to return to the Chaos from which everything comes. She looks upon the world and see people living in a prison called "reality", and plans to relive them of this suffering. Against all odds, she does not hate the sun god Ra. Indeed, being born from his umbilical cord, she loves him as a father and wants to free him the most, by eating him. However, while she does love Ra, she really hates a certain pharaoh. That is because, second her, despite claiming his name and using his power, the rude and arrogant men does not remenber in nothing her wonderful father. Presence Concealment - Rank D: The capacity to hide one's presence as a Servant. It is a common Class Skill of the Assassin class. Child of Misfortune - Rank C: A curse of misfortune due to the events of one’s birth, turned into a strength through tenacity. The user’s offensive power is increased, but the Luck parameter of all allies is lowered. Born as twins with her sister, Assassin’s birth was considered an ill omen. This reputation cast a shadow on her activities throughout her life. Independent Action - Rank B: The ability to remain independent even when rejecting the Magical Energy supply from one's Master; the ability that allows for action even in the absence of the Master. At higher ranks, it is also possible to remain for extended periods of time in this world without an established contract. It is possible for a Servant to stay in the world for two days without a Master. However, this is the ideal value achieved by maximally conserving mana and avoiding battle and Noble Phantasm usage. Charisma - Rank D-: A composite Skill consisting of a person's charm as well as the natural talent to command or unify an army or country. Increases the ability of allies during group battles. A rare talent, and an ability inherent to Servants of the Saver class. Assassin’s Charisma increases the ability of allies during battles, but allied morale is lowered. The Noble Phantasm of one whose legend was a repetition of treachery, devouring those that Assassin put her trust in. UBhuku LukaMenzi grows in power alongside the bonds of trust and alliance between Assassin and her target, being a Noble Phantasm meant to be used on one’s closest allies. The Noble Phantasm can be activated when Assassin’s target is within close range of her. Upon activation, a marsh materializes beneath the target’s feet, binding them. When a foe is caught, UBhuku LukaMenzi renders them helpless by imposing a rank down on their Strength and Agility parameters as well as sealing their Skills and Noble Phantasms for a short time. Ordinarily, each effect can be resisted individually with little trouble. However, if the target has forged an alliance or otherwise grown trusting of or close to Assassin, shrugging off the effects becomes significantly harder. Assassin herself is not affected by the conjured marsh, and as such can approach and finish off a helpless opponent at her leisure. Due to its nature, UBhuku LukaMenzi can only be effectively used once on a single target. Assassin’s true identity is Mkabayi kaJama, the Treacherous Princess of the Zulu. Mkabayi is an outwardly callous woman, and the fierce nature of her youth is rejuvenated by her manifestation as a Servant. She bears some regret for her deeds in life, though she believes strongly in her ends being justification for her unscrupulous means. Mkabayi has little care for how her actions reflect on the views of others, feeling that she does what she does because she must. As such, the opinions of others do not enter into the situation or affect her actions. Despite her current class, Mkabayi considers herself a warrior, a status she clung to for most of her life. She is also proud the Zulu, her people, and in the absence of other claimants to the title, stands as their champion. As such, she will brook no insult, whether to herself or her people, and is likely to respond with violence should something draw her ire. However, Mkabayi is cunning enough to let her temper cool and wait for an opportune moment to exact her vengeance. She is an expert manipulator, having tremendous skill in swaying the opinions of others. This ability is put into use in forging alliances with others, and Mkabayi usually presents herself as wishing to ally with a stronger Servant due to her relative weakness as an Assassin. This claim is no lie, but her true purpose is to hone her Noble Phantasm against those she and her allies cannot defeat otherwise. She is not above abasing herself in order to get in her target’s good graces, and does her best to be useful in any way she can until the moment of treachery comes. Mkabayi is drawn to Heroic Spirits that exhibit strength and firmness of character. This attraction is genuine, and it is possible for her to grow so fond of another as to give up her chance of winning a Holy Grail War, acknowledging them as her ‘perfect ruler’, one that does not need deposing. Should they disappoint her, however, she is bound to plot their downfall. As a warrior princess, she has little interest in those beneath her station or those that she deems ‘weak’. Despite her reputation for treachery, Mkabayi has no real desire to betray her Master. As long as they remain strong, she will remain a loyal Servant, though one liable to act on her own. Should they begin to show signs of weakness, Mkabayi has no objection to abandoning them, most likely seeking to ‘upgrade’ to a stronger Master. Mkabayi retains her wish from life, in that she wishes for the prosperity of the Zulu people. Due to her beliefs, she would wish for a strong, perfect ruler to lead the Zulu. Born as one of twins, she was destined to be killed in infancy according to tradition. Her compassionate father, King Jama, could not bring himself to kill his own offspring, so Mkabayi and her twin sister, Mmama, both survived, much to the displeasure and disapproval of the Zulu people. They feared the wrath of the ancestors should both the twins be allowed to live. This fear became a reality when the queen died before bearing the dynasty an heir. Because Mkabayi had a stronger character than her twin sister, she bore the brunt of the Zulu people’s disapproval and hate. She was held responsible for all the misfortunes of the royal family and the populace at large. When Mkabayi realized that the Zulu people were still yearning for an heir, she wooed Mthaniya Sibiya for her rather indifferent father. The king consequently married Mthaniya and this union produced the long-awaited heir, who was named Senzangakhona (Well-doer). This name reflected King Jama’s acknowledgement that Mkabayi had done well to court Mthaniya for him. This swayed the hearts of the nation towards her, especially since the erratic Jama had offended his subjects once again by marrying a pregnant Thonga woman who had given birth to Sojiyisa. The nation feared that this illegitimate boy would inherit the Zulu throne. Mkabayi soon lost the love she had gained from the Zulu people when, on the death of Jama, she imposed herself on the nation as regent for her brother Senzangakhona. This was unheard of in Zulu history, but men succumbed to her guile and domineering character. Her unscrupulousness shocked the nation once again when she instructed her army to destroy the powerful Sojiyisa, who posed a threat to Senzangakhona’s reign. She was dubbed a bloodthirsty despot and one of the evil women of antiquity, a woman whose primary aim was the continuance of the Zulu dynasty and its traditions. When Senzangakhona came of age, Mkabayi stepped down in his favour, but unfortunately, Senzangakhona was not destined to live long. After a short reign, he was succeeded by his son, Shaka, one of the most able emperors the world has ever known. Shaka, on ascending the throne, ruled his people without recourse to anyone for advice. Yet, despite Shaka’s success, when he was accused of abusing his power, Mkabayi did not hesitate to plot the assassination of a man who was to become the first and most powerful of the Zulu kings. She, together with her nephews, Dingane and Mhlangana, planned the murder of Shaka. Desiring to put Dingane on the throne, she later murdered Mhlangana. Mkabayi remained unmarried, preferring to retain her independence, political influence and position as head of the Qulusi military kraal. She played a major role in Zulu history, deposing various kings and helping them ascend to the throne; her power and influence were felt during this time which was of great historical importance to the Zulu nation. Many years later, when Captain Gardiner went to Dingane on missionary work, he found her old, but still very powerful. She died a lonely woman during the reign of Mpande. For her part in the killing of Shaka, Mkabayi stands condemned to the present day. Last edited by Shiki-pon; January 10th, 2019 at 08:55 AM. Long time since youre last cntribution here Shiki,so welcome in the new year ! A Good profile like Always one Question what would be her Noblephantasm in her other Classes and which Magecraft Version can she use as Xaster ? Have you seen actually my Mothman profile ?How do you find it ? Last edited by Kabalisto Koga; January 10th, 2019 at 09:37 AM. 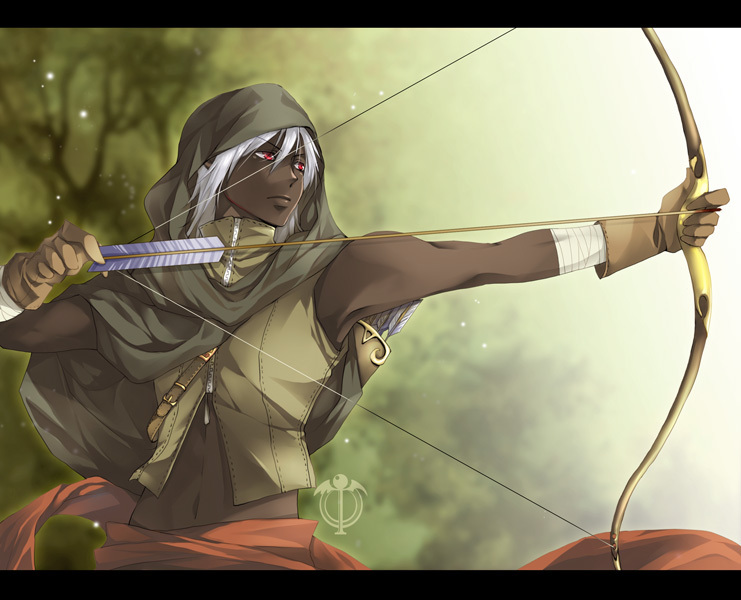 Her NP as Archer would be based on eliminating threats to her people, Lancer's would be spear stuff stolen from Shaka, Caster's would probably be some kind of king-grooming thing (and Caster wouldn't have magecraft of any sort). And yes, I've seen that profile and don't wish to see it again. That about sums up how I feel about it. Magic Resistance - Rank D: Grants protection against magical effects. Differing from the Resistance effect that merely rejects Magical Energy, this ability cancels the spells altogether. Cancels Single-Action spells. Magic Resistance of the same degree of an amulet that rejects magical energy. Despite not manifesting in a class with Magic Resistance, Saber’s relation to Dragon Kind affords him a measure of protection. Mad Enhancement - Rank C: The Class Skill that characterizes a Berserker, raising basic parameters and strengthens one's physical abilities in exchange of hindering mental capacities and/or in exchange for their sense of reason. Rank up for all parameters except Luck and Mana, but in exchange, one can no longer think and speak properly. Breath of the Dragon - Rank C: The ability to release a torrent of mana like the breath of Dragons, the strongest race of the Phantasmal Species. Due to Berserker’s lineage connecting him to Dragon Kind, he can manifest the breath of a Dragon in his current class. Though ordinarily very weak in strength, this ability’s strength is increased due to his deeds in war. The element of Berserker’s dragon breath is flame. Chimera - Rank B: A Skill signifying one’s status as a mixed creature, typically existing as a mixture of several kinds of Phantasmal Species. Affords a multitude of abilities based on one’s lineage. Despite not ordinarily possessing this Skill, the legends of Berserker’s birth and youth allow him to manifest as a Chimera through the effects of Innocent Monster. Berserker is afforded the Skills Monstrous Strength and Fallen Demon. He also possesses the Skill Shapeshift, allowing him to take a more human form, but he lacks the reason to use it. Innocent Monster - Rank B+: An attribute possessed by Servants whose true history and existence have been distorted by the monstrous reputations and gossips they accrued across the course of their life and thereafter, without concern for the actual person's will or appearance. As a consequence, the Servant's abilities and appearance have been rendered to conform to the specifications of their legend. Incidentally, this Personal Skill cannot be removed. Berserker’s appearance has been rendered truly monstrous. Though starting out as a man, in accordance to the legends of his birth he has been mixed equally with the features of a wolf and the body of a dragon. Berserker possesses misshapen wings, claws and fangs as well as a distorted body. His mental abilities have also been reduced close to those of an animal. A Noble Phantasm manifested as the legacy of Berserker’s actions under his king, Matthias Corvinus. Infamous for the villages that he burned, both those of his enemies as well as those of his erstwhile allies, the instinct of ‘burning’ has always been a part of Berserker’s draconic heritage. Ognjeni Zmaj is activated by embracing this instinct of his, resulting in Berserker’s dragon bloodline going berserk. When Ognjeni Zmaj is activated, Berserker grows closer to a full member of Dragon Kind, resulting in his parameters skyrocketing in rank as well as his Mad Enhancement and Breath of the Dragon Skills being significantly ranked up. As Berserker’s constitution was never meant to withstand this kind of power, damage accumulates to his body and spiritual core for as long as he remains in this state. Due to Mad Enhancement, Ognjeni Zmaj cannot be turned off by ordinary means. Once the area of Berserker’s surroundings has been burnt to the ground and his enemies are dead or gone, he will calm down enough for the Noble Phantasm to deactivate. Berserker’s true identity is Vuk Grgurević, the Dragon Despot. As a Berserker, little remains of the brave and skillful warrior that he was in life, his madness leaving little more than a ferocious beast. Vuk fully lives up to the title of Berserker, rampaging through the battlefield without heed for his own injuries, only stopping at the command of his Master or the demise of his enemies. Some of the man he once was remains, in that he only acts like a beast during combat, somehow managing to restrain himself outside of it, to the point of appearing to act with a measure of intelligence not often seen with those driven to madness. Through his draconic nature, the sight of fire has a calming effect on Vuk. In life, the burning of cities was the mark of his task having been accomplished, and these memories serve to give contentment to the beast within him. Vuk has no opinions on his enemies, as in his maddened state he cannot truly tell who and what they are. Things that manage to remind him of the Turks are met with instant hostility, as are those that have slain dragons in their legends, the latter stemming from a bone-deep grudge carried in his blood. As is customary to prevent Berserkers from attacking their Masters, Vuk sees his Master as his king, Matthias Corvinus. Though his madness prevents him from fully understanding the commands given to him, he serves with utmost loyalty, almost to the point of worship. Despite his madness giving him some trouble with following orders, Vuk, unlike most Berserkers, will stop fighting at the word of his Master, as long as his Noble Phantasm isn’t active. In his mythic biography, he is considered to be a supernatural anthropomorphic creature, born with amazing marks: ”An amazing child: a wolf’s paw and an eagle’s wing and dragons under his armpit, a blue flame coming out of his mouth, he won’t let his mother nurse him.” And when he came back from battles, wounded, ”the snakes brought him herbs, and the fairies nursed his wounds, and the wolf licked his serious wounds.” There were whispers that the blood of dragons ran in his veins, and his titles later in life only fed these rumors. Vuk became Despot at an early age, upon the death of his father. Originally serving the Turks as his father had, he participated in a battle against the forces of the Hungarian king Matthias Corvinus, resulting in Vuk and the Turks soundly losing. Impressed by the resistance Corvinus showed, Vuk covertly began entreating the king. Eventually, having pledged his allegiance, Vuk defected fully to the Hungarian side. Vuk was given command over his king’s Black Army, going on to win many battles. During his service, he became feared for his approach of following the crushing of his enemies by burning down the places they retreated to, as well as those towns that had supplied them. After an affront from Corvinus’ western allies, Vuk even took the torch to the towns of Austria, only stopping once they submitted to his king’s rule. His most famous campaign was his conquest and burning of the Turkish-held Sarajevo. One hundred years after this event, the Turks from Sarajevo still mentioned Vuk’s name as a curse. The stay of Despot Vuk in Bosnia and his victory over the Turks were all followed by many songs on the subject. There were many decasyllable epic songs and legends about Despot Vuk and his adventures. Despot Vuk Grgurević Branković died on April 16th 1485. It is not certain if he got killed in a battle or if he died of some wounds or some illness, He was buried in Kupinovo, in Srem. He was married to Barbara Frankopan and had no children. Last edited by Shiki-pon; January 11th, 2019 at 08:28 AM. The first Class Skill of Casters, allowing them to build a special terrains advantageous to themselves. While most Casters use these territories to boost their abilities as magi, Richelieu is not in fact a magus and thus would gain little benefit from them. Instead, he uses his "Palace-Cardinal" to impress dignitaries of all kinds, giving him a significant boost to his political abilities. FGO effect: increases Arts card effectiveness by 10%. The second Class Skill of Casters, which lets them build manufacture magical items, ranging from implements of war to items for daily use. However, time and effort still needs to be spent to gather components and make the items. Richelieu has some knowledge of making items related to his function as cardinal, such as Black Keys or Scripture. Anything else, however, is difficult. FGO effect: increases Debuff Success rate by 6%. The talent to take control of a nation through spies planted everywhere. Richelieu had an incredible amount of people on his payroll, spread throughout France; they informed him of every happening, and there was very little he did not know about. Conspiracies, scandals, and more all found themselves compiled neatly into reports on Richelieu's desk. Richelieu is so known for this that he is sometimes given the title "the father of the Secret Service". In effect, this Skill allows Richelieu to make a Luck check at any time, which allows him to immediately ascertain some piece of information about his opponents. The usefulness and importance of this information is determined by how much he exceeds the Luck check. In addition, this Skill also allows Richelieu to bypass Skills such as Information Erasure and Presence Concealment. A form of magecraft that was adapted into a church form. A mystery taught only to those members of the Church who ascend to the rank of Cardinal or higher. These men make up the College of Cardinals, who elect the new Pope from among their number. The privileges of cardinals are many, including being adressed as "Eminence", receiving golden rings from the Pope, and only being able to be judged by the Pope himself. This Skill is the most powerful Sacrament of them all. It cannot affect physical bodies, but greatly improves the spiritual power of its recipient. Can be used both on the user himself, as well as on others. It could be said that those who receive this blessing receive the Skill "Protection of the Faith" at rank B.
Caster is a veteran of innumerable political struggles, conspiracies, and scandals. As such, this skill shows his immense experience at predicting his opponents' actions and mindset, allowing him to avoid danger wherever he sees it. Even in danger, Richelieu has an instinctive sense for the flow of battle, whether that battle is physical, mental, or political. One example of this expertise is the Siege of La Rochelle, greatest of the Protestant strongholds, where Richelieu acted as commander of the besieging forces. By building a 1400-metre long seawall, access to the city was blocked entirely. With Richelieu in command, the British attempt to end the siege and supply the city was repelled time and again by French artillery. After more than a fifth of the population had died, Richelieu cunningly engineered the unconditional surrender of the inhabitants. The sobriquet by which Richelieu is most popularly known. Eminence is the title of address for a cardinal, and "rouge" for the red shade of their clerical dress, symbolizing their willingness to shed blood and die for their faith. In Richelieu's case, however, the title also alludes to the blood spilled on his orders, notably in La Rochelle and in the Thirty Years' War. In any case, the Noble Phantasm has taken physical form as a scarlet mantle, dazzlingly bright and almost on the level of a Holy Shroud. When it is worn, anyone who tries to attack him must first succeed at a Luck check. Should they fail, their attack will deal no damage at all to the wearer. The mantle can also be extended to cover multiple people, in return for diminishing the effectiveness of its protection. A Noble Phantasm that recalls the "Day of the Dupes". In summary, the enemies of Richelieu, a group that included the Queen Mother, attempted one more time to persuade Louis XIII to dismiss his minister. Marie de' Medici went so far as to declare it was "him or her": either she remained, or he did. After the meeting, the king retired to his lodge in Versailles; Richelieu, desperate, followed him, and was then assured of the king's unceasing support. In the end, the Queen Mother did indeed exile herself to Brussels, among other places. This is an automatically-activating Noble Phantasm. When Richelieu is judged to be in such danger that death could occur at any moment and a target presents itself, all incoming attacks are instead redirected to that target, regardless of the reversals of fate that are required to make this happen. It is a one time only trump which can save Richelieu from even the most desperate situation. Born on the 9th of September 1585 as the son of an impoverished nobleman - ironic, as an exact translation of his name means "place of wealth" - Armand-Jean du Plessis grew up in a France caught in the throes of constant religious war between the French Catholics and the French Calvinists, also known as the "Huguenots". As the third son, Armand-Jean was expected to go into the military - that is, until his older brother suddenly announced he was becoming a monk. Since the family controlled a bishopric in Luçon, this meant Armand-Jean was transferred from the Pluvinel academy to the Sorbonne College to study theology. Though it is not part of official history, it was there that his immense talents became known, and he was quickly inducted into the ranks of the Assembly of the Eighth Sacrament. After becoming a bishop, Richelieu was far away from Paris, where he wanted to be and where the nobility truly resided. Instead, he was trapped in what he called "the ugliest, dirtiest, and most unpleasant bishopric in France." Beset by mudflows, disease, poverty, and worst of all, Protestants, Richelieu took to his duties with admirable zeal while also managing to claw himself into the good graces of the Parisian elite. This he accomplished on a budget so strict that he was forced to contemplate such horrors as drinking cheap wine from Luçon. At the time, France was ruled in theory by the teenage king Louis XII and in practice by the Queen Regent, his mother Marie de' Medici. Richelieu became one of her favorites, which eventually culminated in the bishop becoming her secretary of state and also military affairs. However, this was one of many turbulent periods in French history, and Richelieu found himself at times quelling rebellions, banished to Luçon or Avignon, grieving for his dead brother, unwillingly being on the side of rebellion himself, foiling a plot to cuckold the king, and much more. 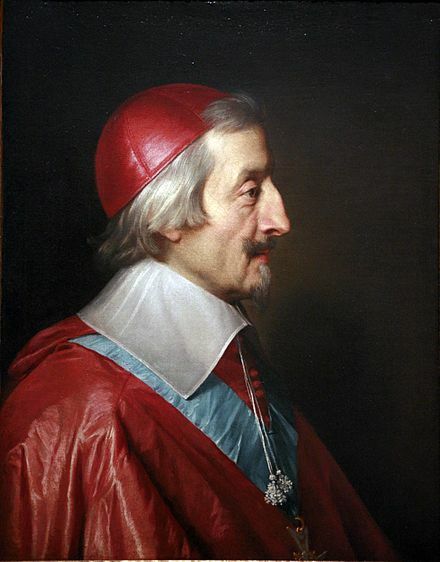 Finally, after much trials and tribulation, Richelieu became a fully-ordained cardinal of the Church, as well as minister of Louis XIII. Even after reaching this distinguished post, he was by no means at peace - he had to secretly negotiate a deal with the Spanish Habsburgs, was almost assassinated multiple times by conspiracies intended to replace the King with his younger brother Gaston, personally interrogate one of the conspirators, and was present at the siege of La Rochelle, where thousands starved. After a long career fraught with innumerable perils, numerous bouts with disease, and freak occurences of luck, Richelieu died at the age of fifty-seven, having been minister for eighteen years. His King would survive one year longer than his cardinal, finally paving the way for the four years old Louis XIV, the "Sun King", in 1643. A true proponent of realpolitik, Richelieu will do almost anything to advance his goals. This includes war, hypocrisy, making himself one of the most hated men in France, starving entire towns, and more. However, what exactly his "goals" are, is impossible to know. He himself claims to merely want France to become ever greater and Catholicism to grow ever more prosperous. In a Grail War, Richelieu will manipulate his Master and his surroundings without the slightest hint of scrupule. Who his Master is, matters less than the fact that he has a Master at all; after all, Richelieu can cajole them into doing his bidding without too much trouble. If there is one crack in his stern and pious demeanor, it is his fondness for nicknames that were based on puns. Mmm. Master, do you know who was the first to say that saying? Me, you say? Yes, that's the popular idea. It's not true that I was the one who first said it, though. It came from a play about my life, actually.Even so, it's quite the marvellous phrase, isn't it? Please listen well, Master. I might never have been the deftest hand with a rapier, but my pen skewered many men to death nonetheless. There are many forms of power, and physical power is merely one. Whenever you find yourself in a difficult situation, please keep that in mind, if you would. F/GO effect: When equipped to Richelieu (Caster) only, increase Arts Card effectiveness of all allies by 15% while on the field. I recently mentioned elsewhere that Richelieu is ripe for becoming a Servant (as are a whole bunch of other famous French figures). So I figured I might as well do it myself. Before writing this, I read the book Eminence: Cardinal Richelieu and the Rise of France by Jean-Vincent Blanchard (2011). It's my main source for the lore section, but even so I had to abridge a lot of honestly pretty interesting history. I'd recommend reading the book if you're into that. It's rather light on details about Grandier or who exactly were in Richelieu's employ for my taste, but it's still a good read. This is my first attempt to incorporate imagined gameplay into a sheet, by the way. Let me know how what you think. Last edited by NMR-3; January 13th, 2019 at 12:37 PM. 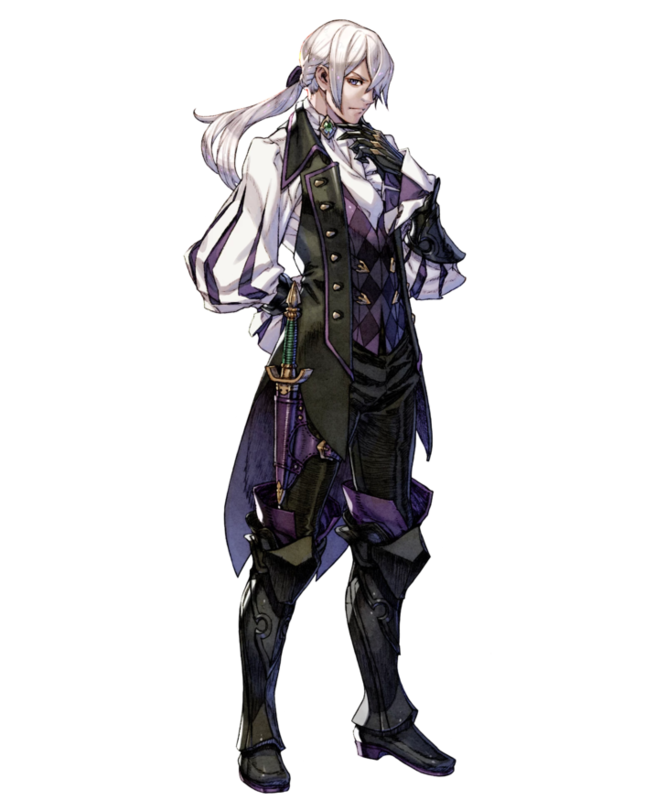 Neat Richelieu, though his Strength and Endurance seem a little on the high side for a Caster (I mean, he acted as a warrior-ish in some capacity, but that would still mean a single rank higher than the container in my mind). On the part of the Skills, Spymaster and its rank are very fitting since he was one of the first of his kind in that respect. I can understand the basis for Eye of the Mind (True), but its rank might be one lower (though given that he was active for quite a long time, one supposes Richelieu would accumulate enough experience for a C rank). Journée des Dupes sorta reminds of an early Richelieu-mockup of mine's NP (might've been Schemas du Cardinale or something), though yours is far more refined. Mine was also more heavily based on his mythos relating to the Three Musketeers. As for the FGO-style statistics, his skillset seems a little on the powerful side. Dropping some of Holy Order Sacrament's effects (in exchange for it being targetable) and making the NP's Nullify Buff effect for 1 time might bring it a bit closer to balanced (in my view, of course). One thing the sheet seems to be missing is any reference to the cardinal's military career. I seem to recall him leading a defensive siege at one point of his career, and I suppose that part of his legend would manifest more strongly in the Caster class rather than the Assassin one. I justified it to myself with the fact that his family meant for him to serve in the military. The difference between C and D doesn't feel that important, admittedly. Yeah, I was hoping to work in more references to the Three Musketeers mythos, but I felt like the lore section was already long. In addition, being entirely honest, I haven't read the Three Musketeers in a really long time, so any references would be rather shallow. Good points both. I'll do just that for the FGO effects. As to the second point, I'd hoped I'd included enough references to his military career elsewhere, but I'll work in some more references throughout the skills. Hi, this is my first time posting a fan-Servant on here, so here goes nothing! Votes were taken and - not long after - the King of France was executed at the guillotine. This death would be the first of many. As a member of France’s Committee of Public Safety, Robespierre was one of the men at the forefront of what would later be called the Reign of Terror - an attempt to control political activity in France after the revolution via a spree of executions. By the end of this period, over 15,000 executions had been carried out, including that of Robespierre’s friend and ally Georges Danton, who had launched the Committee. Some joked - with a noticeable anxiety in their tones - that Robespierre would eventually see all of France at the guillotine. Robespierre himself argued that terror was necessary together with virtue, that “terror is only justice prompt, severe and inflexible.” Eventually, those around Robespierre turned on him and he was arrested. After a failed attempt to commit suicide, he was restrained and - for the night before his execution - kept in the cell where Marie Antoinette had spent her final hours. The following afternoon, Maximilien Robespierre was executed by Charles-Henri Samson on the Place de la Révolution. It is said that - rather than last words - Robespierre gave a bloodcurdling scream, silenced only by the fall of the guillotine. Ruler is a person capable of strangling his own desires for the sake of what he considers best for France. Despite opposing the death penalty - finding it barbaric - he pursued it as the best means of preserving the Republic, taking steps to ensure that executions could be carried out more quickly and in greater numbers. For Ruler, there are no regrets. Even if he had to stain his hands with the blood of thousands, even if he sent friends and allies to their deaths, even if he himself was executed to the thunderous applause of those who once supported him - as long as it protected the majority, and helped preserve the freedom they had fought for, it was an acceptable outcome. He accepts it, too, if he is seen as a monster. He himself cannot deny that perspective, for his actions were monstrous. But what he cannot stand are those that stood by him throughout that Reign of Terror, only to turn against him and cast all blame on him when it became convenient. When blamed for the death of his close friend Danton at the last Assembly he attended, he replied only with: "Is it Danton you regret? ... Cowards! Why didn't you defend him?" As Robespierre never came into contact with magecraft during his lifetime, he has a low level of Magic Resistance despite his class as Ruler. In fact, the only reason it is this high is due to Ruler’s strong mentality lessening the effects of magecraft somewhat, along with the spiritual protections gained by founding the Cult of the Supreme Being. If summoned as a Ruler, during a direct encounter, a Servant's true name and entire status information will be automatically revealed. In regards to Servants with concealment abilities, a Luck Check is required to bypass those abilities. As Ruler, he has the authority to use Command Seals against other Servants, possessing two for each participant in the War. The effectiveness of these Seals is at a slightly lesser rank than other Rulers - but this potential lack of obedience is something Ruler can compensate with using his first Noble Phantasm. As the member of the Committee of Public Safety who took centre stage throughout the Reign of Terror, Ruler was one capable of leading people to acts of great ruthlessness by showing them his dream of a utopian French Republic. However, as this skill is ranked B-, it has the potential to fail Ruler when he most needs it. A skill for those who falsely claim godhood, or become known as false gods. Although Ruler did not claim himself to be a god in life, he founded the Cult of the Supreme Being, a new religion based on his own ideals and beliefs. His political opponents used this to their advantage by spreading rumours that Ruler had secretly declared himself a prophet and the god of his new religion, hence the acquisition of this skill. As this Divinity is false, it only takes effect when it comes to negative conditions. For example, chains that bind the divine more tightly or blades that are more powerful against gods. As Ruler was not summoned into the Caster class, he does not have the Innocent Monster skill that he usually receives alongside this one. A will of iron that will never surrender. A skill that allows Ruler, one who was known in life as the Incorruptible, defense from physical and mental damage until his goal is achieved. Even if he has to kill another 15,000, his goal will be achieved. No matter how much blood must be spilt, a utopia will surely be found. A conditional bond that Ruler can place upon a target by making physical contact, and a crystallization of the Reign of Terror that he led in life. Once La Terreur is placed upon a target, an invisible guillotine blade is affixed to their neck - the target, of course, is unaware of this. At any time, Ruler can activate the instance of La Terreur attached to a target and instantly decapitate them. This, however, is not the full scope of La Terreur’s frightening ability. Whenever a target affixed with La Terreur enters an alliance or partnership with others, new instances of La Terreur will automatically be attached to these allies. These new instances of La Terreur can also spread in the same way. Thus, the influence of La Terreur grows exponentially if an affected target is allowed to act freely. Ruler can execute specific targets as he pleases, or execute all individuals affixed with La Terreur at once. In life, Ruler often wished that executions could be expedited so as to secure the revolution as quickly as possible. Now, he need only snap his fingers to take a life. With the execution of Louis XIV, the age of the divine right of kings began to come to an end, bringing the world into its next state. This was the execution of not only a man, but an era of history, and thus the death and rebirth anew of the world order. Era’s Execution is a weapon formed from this act, designed to move humanity into the future by means of executing the past. As such, this weapon deals more damage the older the Heroic Spirit it is used against. Against the most ancient of heroes, it is the equivalent of an A-Rank Noble Phantasm that can cut through armour and flesh like butter. Against the newest Heroic Spirits, however, it is barely recognizable as a Noble Phantasm at all. The Reign of Terror was announced with the following proclamation: "It is time that equality bore its scythe above all heads. It is time to horrify all the conspirators. So legislators, place Terror on the order of the day! Let us be in revolution, because everywhere counter-revolution is being woven by our enemies. The blade of the law should hover over all the guilty." In accordance with these words, Era’s Execution takes the form of a scythe. Ruler finds this fitting - a mere farmers tool, the symbol of the underclass, taking the lives of the oppressors above them. Bond 10 CE: "My Last Words"
I wish to curse all those that stood with me and abandoned me. Who told me my actions were just when they didn’t believe in them. Who walked down the path to utopia with me, only to leave me alone at its gates. I wish to ask to live just a little longer. I wish to plead with the crowds to let me watch the Republic enter the peace I know lies before it. I’ve worked so hard, I’ve done so much. Please … please let me see this beautiful ending. I wish to speak. But there are no words. So I scream. And I stop. Last edited by Tanhony; January 12th, 2019 at 08:48 AM. Hello there, welcome to the forums. I'd say that your Robespierre is quite good, though I have some nitpicks. First, I don't think he really fits as a Ruler class, but I can see why you make him one. I don't have much objection for the Class Skills, though you could probably justify his Magic Resistance by tying it with the cult he founded. Also, tying God's Resolution with his 1st NP is a nice touch. As for the Personal Skills, it's not bad per se, I just have suggestions to make it better. First, while Charisma is certainly fitting for him, I think Incitement would be a better alternative. As far as I know, the Cult of Supreme Being never claims Robespierre as god or any sort of divinities--of course, one could argue that he was the cult's prophet--as such, I don't think Divinity, even if it's a false one would be necessary for him, personally I would just tie this "revolutionary religion" to his 2nd Noble Phantasm or perhaps make a Unique Skill out of the cult. For Undying Will, it is fine, just want to point out that Robespierre was actually known as l'Incorruptible, so maybe you might want to mention that in the description. The Noble Phantasms are also quite good. The 1st Noble Phantasm is nice and fitting, and the 2nd Noble Phantasm is also a good embodiment of the French Revolution and Revolutions in general. Overall nice job. This is one of my favorite Robespierre sheet beside Fabuzer's Berserker Robespierre. Last edited by 34; January 12th, 2019 at 01:24 AM. As far as I know, the Cult of Supreme Being never claims Robespierre as god or any sort of divinities--of course, one could argue that he was the cult's prophet--as such, I don't think Divinity, even if it's a false one would be necessary for him, personally I would just tie this "revolutionary religion" to his 2nd Noble Phantasm or perhaps make a Unique Skill out of the cult. Thank you for your kind words - I've changed Charisma to Incitement (which I didn't know existed) as you suggested and tweaked the description of Magic Resistance a little! In regards to Divinity (False), I gave him it based on an event where - although he himself didn't claim to be a god - others claimed through third parties that he had claimed to be a god. Catherine Théot, a 'prophetess', claimed that Robespierre was "herald of the Last Days, prophet of the New Dawn" because he'd put the Festival of the Supreme Being on the day of the Pentecost, which is traditionally a day of divine manifestation. When these claims were reported to the Assembly by Robespierre's enemies, they made it sound as if though Robespierre himself had made these claims to Théot, turning people against him. So it's essentially a Divinity born of slander rather than anything he or even the religion he created ever claimed. In regards to Divinity (False), I gave him it based on an event where - although he himself didn't claim to be a god - others claimed through third parties that he had claimed to be a god. Catherine Théot, a 'prophetess', claimed that Robespierre was "herald of the Last Days, prophet of the New Dawn" because he'd put the Festival of the Supreme Being on the day of the Pentecost, which is traditionally a day of divine manifestation. When these claims were reported to the Assembly by Robespierre's enemies, they made it sound as if though Robespierre himself had made these claims to Théot, turning people against him. So it's essentially a Divinity born of slander rather than anything he or even the religion he created ever claimed. Oh, I didn't know that, thanks for clarifying! True Name: Shaka Senzangakona "The African Napoleon"
A stoical and strong-hearted man. He is remorseless in achieving his ambitions, caring not how many lives he has to trample along the way. In battle Lancer is a shrewd tactician who fights without respect for honor, not hesitating to use dirty tricks like traps and ambushes to prevail against a superior foe. If asked to justify his brutality Lancer would just say that it's the right of the strong to devour the weak. Those unwilling to accept that fact have no right to be called warriors. However, he does have a more humane side as well. If an enemy submits to him freely and surrenders, Lancer will gladly spare their life and offer them a place amongst his soldiers. He would never go back on an oath or betray a comrade, holding his pride as a warrior-king to be above such base conduct. Lancer's devotion to the field of war makes him appear almost robotic. 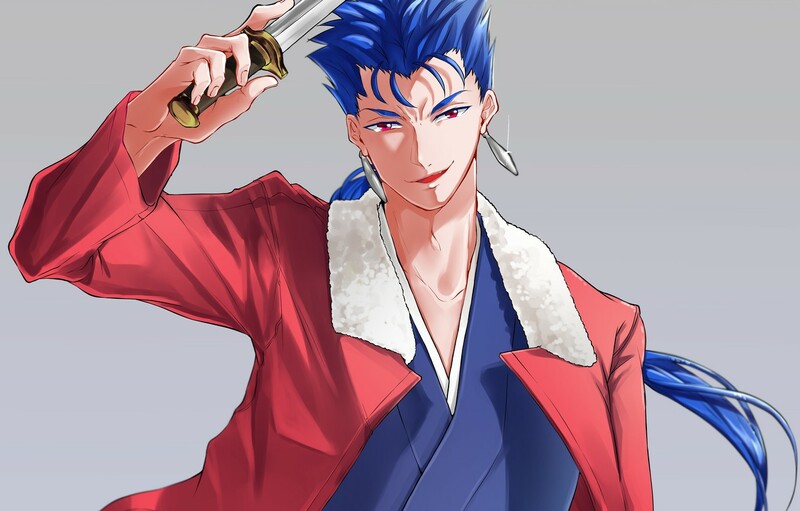 But to those he trusts Lancer will show a more carefree and friendly side to his personality, cracking a smile and even joking on rare occasions. Still, he's not exactly the world's best conversationalist, and his sense of humor tends toward the morbid side. He's quick to anger, but tends not to hold a grudge for very long. If you insult him he'll punch you in the face, but won't have any problem going out for a drink with you later that day. On the rare occasion Lancer is truly wrathful, he won't lash out or otherwise react right away. Instead, he seethes with cold fury, biding his time and waiting for the best opportunity to avenge himself on the object of his ire. Then his revenge will come swiftly and brutally. If Lancer's normal anger is like a wildfire that burns quickly and is extinguished, then his true rage would be akin to a volcanic eruption that slowly builds up before finally exploding. As he never married or had children for his entire life (fearing usurpation by a potential heir), Lancer is surprisingly shy and easily flustered around women. This goes double for women with motherly-type personalities, due to reminding him of his beloved mother Nandi. Lancer disdains projectile weapons, calling those who rely on them cowards unfit to be called warriors. For him a true warrior fights in close quarters where they can look into the enemy's eyes as they're killing them. To kill from afar without any danger to oneself is a disgrace to your opponent and your own pride as a warrior. One of Lancer's redeeming traits is his deep love towards his mother Nandi. Nandi was one of the few people who treated the young Lancer with kindness, despite his disgraced birth and the taunts he endured from the local boys. She always reassured Lancer that the spirit of a true king blazed within him, no matter what anyone else said. When Nandi died, Lancer went insane with grief and ordered a massive nationwide period of mourning where anyone deemed to show insufficient grief was executed on the spot. Thus, Lancer's wish on the Holy Grail is not for conquest or glory, but simply a chance to see his beloved mother one last time. Lancer's relation to his Master is that of a king to their retainer. Depending on whether they prove their worth he will treat them either like a trusted advisor or an incompetent clown not worth his attention. Lancer doesn't want a simple yes-man though, approving of a Master willing to question him and debate strategy. Additionally, as a man who prizes courage highly, the willingness to risk one's life on the front lines is an absolute necessity to serve as his Master. Lancer would despise any Master who resolves conflict through manipulation and subterfuge without ever setting foot upon the battlefield. Confers protection against magical effects. At this rank only Single-Action spells are nullified. Magic Resistance equivalent in degree to an amulet that rejects magical energy. Born after the decline of the Age of Gods and having rarely brushed against Magecraft in life, Lancer sports only a minimal level of resistance to the arcane arts. A unique Skill afforded to heroes who brought innovation to their respective eras. A conceptual revolution that subjugates the old to the new. Lancer is credited with inventing the Iklwa, a short spear with a massive sword-like spearhead. Unlike the Assegai, the former dominant spear of his age which was meant to be thrown from afar, the Iklwa was created for use in melee. Lancer's usage of this weapon revolutionized African warfare, lending him and his men a terrifying advantage over opponents who clung to the traditional practice of throwing their spears and avoiding hand-to-hand combat. His confidence in these tactics was so great that Lancer even boasted the gunpowder weapons of the Europeans were no match for an army of well-trained Zulu spearmen. It is undoubtedly Lancer's innovations in the field of war that propelled Zulu to one of the most powerful nations in Africa. Reproducing this advantage, Lancer gains + modifiers to his physical parameters while facing enemies who rely on ranged weapons. This Skill also confers him Protection From Arrows at the same rank, allowing Lancer to intuit the trajectory of incoming projectiles and swat them aside with his spear before they can reach him. A heightened capacity for observation, refined through training, discipline and experience. An ability possessed mainly by mortals rather than the gods, honed through tenacious training. So long as there is even a 1% chance of comeback, this Skill greatly improves the chances of victory. As Rider (the Class emphasizing his aspect as a commander rather than a warrior) Shaka would possess in place of this Skill Military Tactics at rank B. The ability to inspire others and lead armies in battle. At this rank, one's level of charisma is suitable for ruling an entire country as its king. Through war and diplomacy Lancer almost singlehandedly unified the squabbling tribes of Zulu into a fearsome fighting machine. However, because of the insanity that marked the later years of his reign, a - modifier has been attached to this Skill. The ability to continue combat while injured, and return alive from even the roughest scrapes. As an illegitimate child, Lancer had to claw his way up just to survive, an indomitable will to live which has been sublimated into this Skill. Fatal wounds do not dull his fighting spirit. Dragging his broken body up by his spear if necessary, Lancer will keep fighting no matter how wounded he becomes. However, as it is merely the ability to "keep fighting" rather than "to survive", he can still perish in the end from amassed battle damage if his injuries are not properly treated. In the Berserker Class this Skill would be strengthened further, reaching the level of pseudo-immortality. Through fusing with his demonic spear Shaka can grow tiny spear shafts inside his wounds, crudely stitching them together. These shafts can even serve in place of damaged sinews and muscle fiber. This process is incredibly painful for Shaka, but his high willpower and Mad Enhancement allow him to shut out the pain. The more damage he takes the more Shaka becomes a grotesque puppet of flesh, held together only by countless demonic spears. A culmination of the insane training regimen underwent by Lancer and his soldiers, who allegedly walked more than fifty miles without sandals on rough, rocky terrain to build their endurance. This Noble Phantasm toughens Lancer's body to the point where it serves as a kind of natural armor, dulling the damage of any physical attack targeting him by one ranking. As a secondary effect, it also negates any degradations to his Agility parameter incurred by traversing rough or uneven terrain. A Noble Phantasm born from Lancer's invention of the Iklwa spear, revolutionizing the field of African warfare. It is not any particular spear he wielded in life but a distillation of the very concept of "Iklwa", bearing the essence of every spear of its kind to have ever tasted battle during and after Lancer's reign. Having been soaked in the blood of entire nations, Lancer's Iklwa is a demonic weapon with a will of its own that thirsts for bloodshed and slaughter. It whispers to Lancer in a phantom voice only he can hear, begging him to slake its thirst with the blood of more powerful warriors. A normal human wielding the spear would go insane almost instantly from its influence, but it seems Lancer's willpower is strong enough to overwhelm the demon inside his spear and subjugate it to his own will. Alternatively, maybe his personality is just insane enough that there's no difference between Lancer's voice and that of the spear. During battle, the spear's bloodlust expresses itself by actively seeking out the opponent's blood, lending Lancer's strikes a preternatural accuracy. Wounds dealt by the spear carry a curse that makes them endlessly leak blood and Mana until they close over, meaning that even the smallest scrape has the potential to severely cripple the enemy if they can't stop the bleeding. Summoned as a Berserker, Shaka would fuse with his demonic spear, gaining the ability to summon copies of it by pulling them from his own body. In that Class the Iklwa's bloodthirsty impulses would completely overwhelm Shaka, transforming him into the true beast of destruction he's sometimes vilified as. "Weep and know that your gods have forsaken you! With this blow I shall inflict desolation! Mfecane... Iklwa!" The maximal output of Lancer's demonic spear, evoking the widespread destruction that followed his conquests and depopulated a vast swath of Southern Africa. To activate it, Lancer recites this Noble Phantasm's true name and throws the spear high into the air like a javelin. Upon doing so a giant crimson magic circle materializes in the air above Lancer, casting a bloody pall over the entire landscape. A moment later thousands of Iklwa spears, symbolizing each and every man, woman and child who perished by Lancer's spears, come hurtling from the sky like rain. Each spear that hits the ground detonates in an explosion of bloodied magical power comparable to a modern day ballistic missile. The combined power of this bombing raid-like attack is easily enough to reduce the entire battlefield to a desolate wasteland. After the bombardment is completed the original spear will return to Lancer's hand. Shaka: Though the sheet is otherwise great, I'm a little weirded out by the fact that Shaka's Strength is his lowest physical stat, given his assumed prowess as a warrior (and the traditional virtue of a warrior being strength). Though the answer might be to switch ranks with another parameter, I can't really see Endurance being lower either, but there are plenty of examples of slower Lancers (not that C would be particularly slow). Iklwa being both a Skill and part of his Noble Phantasm also feels a little redundant. I didn't want to give Shaka really strong stats given he's a fairly modern figure who lacks any overt supernatural feats. I figured Endurance should be high given his determination and feats of stamina, and Agility should be high because Lancers generally have high Agility (plus he did train his mobility with marching exercises). The thought occurred to me with Shaka's variant of Innovation having the same name as his NP, but I couldn't think of any better name for it. You're welcome to suggest one though. Thanks for the feedback Shiki! I suppose one option for the Skill name would be Mfecane/Difaqane/Lifaqane - Innovation, which would refer to the warlike nature of the Zulus and how their revolutionary style of warfare caused major depopulation in southern Africa (the term and its alternatives literally meaning "crushing, scattering or forced dispersal/migration"). And speaking of unique Innovation-Skills, any ideas what a Meiji Ishin - Innovation might do? I was thinking something along the lines of increasing the power of rightful rulers (and maybe weakening regents and so forth), but that seems a little derivative of Nobu's Tenka Fubu. That kind of goes from ripping off his second NP to ripping off his third NP . Not really sure if that's any better. But thanks for the suggestion anyways. I'm not really familiar with the Meiji Restoration. Since it seems to have been meant to restore the traditional authority of the emperor, maybe you could make the Skill an explicit counterpart to Nobu's, giving a bonus against enemies with low divinity and mystery. But as I said, I know very little about the historical movement in question, so I might be totally off-base here. Also if anyone cares, I just added a section to Shaka's profile outlining his relationship to his Master. Sasaki Tadasaburō & Imai Noburō: Members of the Miwamarigumi (similar to the Shinsengumi, but composed of higher-ranking samurais and sons of the shogunate's retainers). They don't have cool feats like Okita or Hijikata, but they confessed to have been the ones who killed Sakamoto Ryōma, so something could be done with that as a basis. They could have Scapegoat as a reference to how Kondō was accused of killing Ryōma, although it's not as if they blamed him directly. Kagutsuchi: The kami of fire who killed Izanami by accident during his birth. He should be really OP since not only he killed a goddess, but also introduced the concept of death in the Japanese creation myth. As for the class, he could qualify as Saber (patron of blacksmiths, plus he was killed with a sword), Assassin (first to kill somebody), and Berserker (in a version of the myth, the water kamis were created to pacify him). Gustave Eiffel: This one may result harder to do. The Eiffel Tower is the most obvious NP. One of its functions would be nullifying the Fame of anything in a large area, but that doesn't look like enough reason to build a 300-meter tower. Another NP could be the Statue of Liberty as a golem. Also, aerodynamics. Eiffel loved aerodynamics. Tamiya Iemon & Oiwa: The main characters of Jaoan's most well-known horror story, the Yotsuya Kaidan, which by the way looks as if Shakespeare went to Japan on holiday. There's a very famous picture of Oiwa's ghost emerging from a paper lamp made by Hokusai, and her character inspired the famous Sadako. As for Iemon, he ends up becoming crazy for being haunted all the time, and gets pissed off many times during the play, so he could be a Berserker. Marduk: He soloed Tiamat at her strongest and her 11 children, so strongest god ever? Any idea I have for his NPs is basically Gil, unfortunately. I mean, his weapon Imḫullu is basically Ea, and his net of the four winds does a better job at binding than Enkidu since Tiamat couldn't break free from it. I had an idea for the latter that made it a Bounded Field preventing development by means of constant erosion, which prevented that Tiamat used her Monstrous Strengthor Self-Modification​. Mhmm Kagutsuchi and Marduk are on the to do list nice,thanks for the ideas Padoru !